For once I've got an afternoon flight for my trip to Portland... which means time for breakfast, lazy packing, and a quick post. The book blogging world is about to lose one of its best voices. Bookseller Chick is losing her job, as her West Coast store closes. Her posts pounded into my head the fact that chain store employees are booksellers too, and chain stores aren't immune to the tragedy of closing doors. In my opinion, few booksellers in any kind of store have the depth of insight, egalitarian spirit (i.e. romances get pride of place next to "literary" stuff), connection with both readers and authors, open-minded inquiry into why the book industry is the way it is, and skill at wryly expressing the bookstore life that this anonymous chick does. Check out her poignant postings on the closing process, and click through the archives for a wealth of conversations about books and bookstores. Hopefully, BS Chick will continue to blog about her future book world endeavors -- she's a force to be reckoned with. That's it. 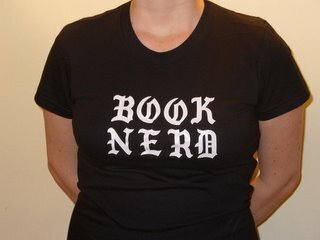 I'm off, wearing my Book Nerd (Cool Nerd?) T-shirt -- see you at Powell's tonight, or back on the blog next week! Pre-Winter Institute check-in; Special Report Offer! What would you like to have your Book Nerd report back from Winter Institute? I've got my own agenda of sessions I'd like to attend, but if you're particularly curious about an educational topic, an author, a vibe, a party, or anything else, I'll do my best to check it out and write about it, either here or via email. Get your requests in via comments or email before Wednesday at 10 a.m. (that's when I have to leave for the airport), and your embedded Book Nerd will bring you the scoop. Until next week -- signing off! You approved it -- you got it! At long last, the fine folks at Brainiads (thanks, Max!) have hooked me up with my very own blog advertising. Right under my profile you'll see a rotating lineup of reader-friendly advertisements for stuff you, the readers, might actually be interested in. Click through and your Book Nerd might make a penny or two. Let me know what you think! Sorry, WN readers -- I had to go out of town unexpectedly for a funeral, and I'm just back and getting off to a slow start this week. Check back Wednesday for a full report on ABA meetings (minus the "strictly confidential" stuff I can't tell ya), book reviews, and other doings. I'm slightly ashamed to report that on the plane I read half of a book I should have finished ages ago, and two brainless girl magazines, as is my wont. Question to the readership: what's your idea of a perfect airplane read? A lot to cram in today, because this Wednesday (typical posting day) is a day of ABA. In the morning I will have the honor of participating in the Author Selection Committee for Book Expo America -- examining, along with other booksellers, the list of authors submitted by publishers (strictly confidentially!) as potential speakers and participants in BEA 2006 to be held in New York in June. Then in the afternoon, I'll be part of the first first ABA DTF -- the American Booksellers Association Digital Task Force. This will be a group of forward-looking booksellers taking a look at all those technological developments that occupy our minds, and figuring out ways that independent booksellers can take advantage of them and develop along with them. I'll give you my full report on those meetings next Monday. In the meantime... with the dozens of independent bookstore closings in the news, have you ever wondered how many independent bookstores OPENED in 2006? Ninety-seven. That's how many. The ABA reports in Bookselling This Week on new bookstore openings (actually UP from 2005! ), and the innovative approaches of this new generation of indie booksellers. Told ya, didn't I? And here at home, the Times finally takes a look at the wonderful plethora of surviving and thriving indie bookstores in New York City. My bookstore gets a mention, along with the wonderful and inimitable Books of Wonder, St. Mark's, Oscar Wilde, and many other favorites. And this isn't even the half of them. How lucky we are around here. In the spirit of this joy in books, I humbly submit for your persusal: A Reader's Year. Here are all of the books your Book Nerd read and reviewed this year. Of course, as with all of you, this doesn't represent the entirety of my reading. I read any number of comic books and compilations. I've probably read this book (by my friend Stephanie) a dozen time or so, all told. I'm in the middle of probably half a dozen other books that I'll finish at some point. And then there's the periodical and blog reading. But these are the books I faithfully recorded and reviewed here on the blog. You'll be pleased to note that I made my goal of 52 books read this year (if you count the last one, which I finished on New Year's Day). (The ALP recently did a similar tally, with the same restrictions; his total was 97, the rotter. Hence the L in ALP.) The bold titles represent my personal Best Of 2006; you can click through the archives to read my reviews. All in all, it was a good year for books. Do you have a list of what you read in 2006? What were your favorites of the year? Holy Cow. It has just now come to my attention that when I got my shiny new Mac, not all of my email accounts followed me from my old computer. So if you have emailed Book Nerd in the last month and have been puzzled and hurt by my lack of response, I've just gotten your email in my inbox, along with about 150 others. I'll respond as I can. Sorry for the technological screw-up -- I am a print media person, after all. This should be the post where I list all the great books I've read in the past year, and rhapsodize about the great things in store for books and the book industry in the coming year. But I have to admit my enthusiasm and energy are at a bit of an ebb tide at the moment. Maybe it's post-holiday letdown (and our store had a wonderful, exhausting, expectation-exceeding holiday). Maybe it's that my energy has been drained by a too-long wrestle with the flu. Maybe it's just that Mercury is retrograde, as one bookstore customer always insisted was the cause when things were going wrong. It's an easy time to get to feeling down. There are plenty of stories going around about the number of bookstores closed this year, or about to close. Interestingly, the New York Times has in-depth pieces about three of those closing stores: Coliseum, Micawber Books, and Murder Ink / Ivy's. I find the words of the proprietors of each of those stores rather illuminating regarding the different perspectives one might take toward a run of bad news, or just a case of the blues. George Liebson of New York's Coliseum Books doesn't hold back in this article. In what is sure to become his most famous quote, he states "Running a bookstore is like running an insane asylum." Keeping the booksellers and customers from killing each other, while preventing "the great American public" from spilling coffee on books, has been his primary function, he says. I mean no disrespect to Mr. Liebson, but it seems to me that it's just as well he's getting out of this line of work. If one thinks of customers (and employees) as a sort of sinister force of nature to be contained, retail work is probably not going to be especially satisfying. One had better love people as well as books if bookselling is going to be a fulfilling life. This seems to me somewhat of a blaming response to misfortune: a completely natural response, but an unhappy one. Logan Fox of Micawber Books is in a slightly different situation. He has managed to sell his Princeton bookstore at a profit (making way for Labyrinth Books to come in and fulfill the academic book needs of the town, in cooperation with the University). His implication is that this is a pre-emptive strike against a future bookstore failure. His quote: “The old days of browsing, the old days of a person coming in for three or four hours on a Saturday and slowly meandering, making a small pile of books, being very selective, coming away with six or seven gems they wanted, are pretty much over. If you go to the Strand or to Micawber Books today, it’s a whole different gear, where society wants satisfaction and fulfillment now.” Though he seems less angry that Liebson, Fox is saddened by the state of the culture, and worried that bookstores like his will have no place in it. Jay Pearsall of Murder Ink and Ivy's Books speaks for himself in this opinion piece. Reflecting on 17 years of running the tiny pair of bookstores on the Upper West Side (one dedicated to death, one to life, as he observes), his memories are primarily happy, though tinged with wry humor, and observing that his shop invited thieves as well as famous authors and loyal neighbors. His quote: "S0 much about running a bookstore is about control. You order books, arrange them, straighten them, move them around. You create an environment, a place where people are comfortable and interested, and you try to do it all without it looking as if you did anything special." But he takes a quotation from his reading to explain his loss: "One can only do so much to control one’s life." Somehow, his response seems to be acceptance. I still want to open a bookstore, despite the odds. And I'm still confident, underneath the blues, that I'll do it, and that it will be a success. But chances are it won't last forever. I only hope that after a good, long run, full of exciting events, building of friendships and alliances, long strings of days like pearls slipping off a string (to quote from my childhood favorite Anne of Green Gables), lots and lots of reading, many triumphs and losses -- after all that, if and when I close, I hope my attitude is like Mr. Pearsall's. I hope I can embrace the experience of a wonderful bookstore, and when the time has come to let it go, to let it go (Mary Oliver there -- it's a day of quotations). The new year seems like an odd time to reflect on endings. Maybe it's because I've just finished Mark Helprin's WINTER'S TALE (review to come) that I'm thinking about balance, about the "justice" of opposing forces of creation and destruction. In any case, it can never hurt to observe that this, too, shall pass. If there's anything a lifetime of reading can teach us, perhaps it's that. We booksellers and readers would do well to absorb the wisdom of writers, and our own experience, and be grateful for our riches while accepting our losses. Later this week I'll be back with some less philosophical stuff: reviews, a tally of the last year in the reading, and some more links. In the meantime, happy reading, and Happy New Year.